The GLS borrows design elements from the 2019 GLE, which is no bad thing. Will feature Merc’s latest interior with twin digital displays and the latest MBUX infotainment system. Mercedes claims that the wheelbase is longer by 62mm than the outgoing car. Will feature a wide range of engine options, with an AMG variant included in the kitty. Maybach edition will come at a later date. 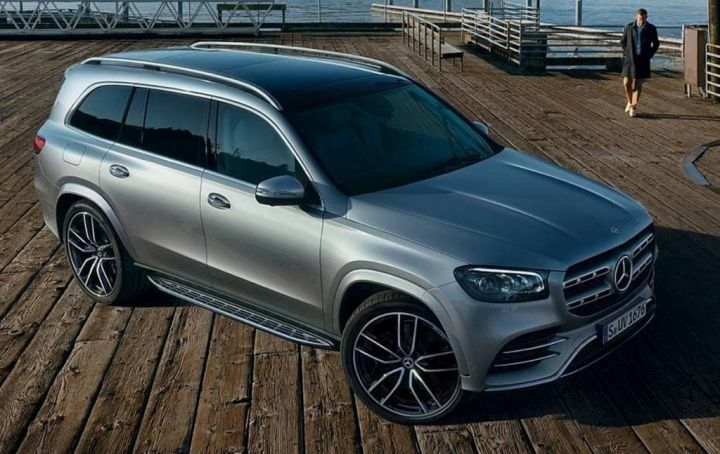 The latest iteration of Merc’s full size SUV, the 2020 GLS, has been leaked accidentally by Mercedes Switzerland just before its official unveiling at the upcoming 2019 New York International Motor Show. With the pictures in hand, we can now let you know what to expect from Mercedes’ gargantuan new SUV. For starters, the GLS looks like a scaled up 2019 GLE which is currently available internationally. The GLS is based on the MHA platform which currently underpins the GLE. With the introduction of the highly capable platform, this allows the GLS to support various powertrain options including the 48V hybrid powertrain. Ditching the current car’s boxy styling, the next-gen SUV takes a more rounded approach in its design. At the front, you get a huge twin-slat grille with an XXL-sized tristar logo integrated into it. Flanking the grille are a set of redesigned LED headlamps which retains the typical Mercedes ‘eyebrow’ DRLs. Below them are aggressive-looking air dams which give the SUV an air of sportiness. On the side, the GLS gets humongous wheels which fill up the huge wheel arches. It has a clean side with just two crease lines running through, giving it an air of simplicity and elegance. The GLS keeps things simple at the rear with a slim set of split LED taillamps that are sleeker than the previous car and feature a unique signature. At the bottom, you get twin exhausts with chrome inserts for extra bling. In terms of sheer size, the new GLS continues to dwarf the competition. Mercedes claims that the wheelbase of the GLS is longer by 62mm than the outgoing car and 33mm than the BMW X7, thus offering more rear legroom than the X7. Inside, the GLS gets the chunky three-spoke steering wheel with touchpads to control the twin screens that’s seen on current day Mercs. Mercedes will drape the cabin with expensive pieces of leather, wood and metal, and we expect the carmaker to offer various customisation options. On the centre console, you get twin screens which are connected to each other, removing the cluttered centre console. The twin displays will feature Mercedes’ MBUX system which will offer a high resolution cockpit with a touchscreen infotainment system. The MBUX system also offers other functions like navigation with augmented reality and intelligent voice control which is activated with the keyword “Hey Mercedes.” The MBUX system can also be personalised to suit the needs of a particular user. Under the hood, the GLS will be offered with a wide range of engine options, including the latest 48-volt hybrid unit. AMG variants are expected to come with Merc’s 4.0-litre Biturbo V8. For India, the GLS is expected to come in the GLS 400 and GLS 350D form, same as the current car. The former is powered by a 3.0-litre six-cylinder petrol motor which produces 337PS and 480Nm of torque. The GLS 350D on the other hand is powered by a 3.0-litre six-cylinder diesel motor which produces 261PS and 620Nm of torque. Both the engines will be upgraded to meet the upcoming BSVI norms that will come into play in April 2020. All variants of the GLS are likely to feature Merc’s 4MATIC and will be powered by the 9-speed automatic gearbox. The new GLS is expected to be launched in India by early next year. When it comes to India, expect it to be priced north of the Rs 90 lakh mark. A Maybach version of the GLS is also on the cards later. The Mercedes GLS will take on the Audi Q7 and the upcoming BMW X7, which will also make its way to India soon. Unfortunately it shares the same display console as the much cheaper A class. Unfortunately it shares the same display console as the much cheaper A class. Share your experiences with GLS?